Great way to start with five core products PLUS our anti-aging Calming Cream! Moisturizer. Richly moisturizing and calming with Vitamin K and Willowherb Extract to reduce visible redness while soothing the skin. Delivers superb moisture and hydration to sensitive and irritated skin. L-Alpha Bisabolol and other chiral ingredients provide excellent skincare benefits as well as aid in the appearance of healthy skin. Protects skin against dryness and helps the skin retain its natural moisture. Paraben free. Serum. Very rich in skin calming & soothing ingredients yet with a light consistency. Reduces visible redness while helping to normalize the skin and reduce the apearance of thin red facial lines. Also contains green tea and grapeseed extracts, which are potent anti-oxidants. 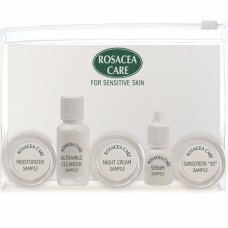 It has been Rosacea Care bestseller for almost two decades! Paraben free. Night Cream. Richly moisturizing cream designed to soothe the skin and aid in calming dry or damaged areas through the night. Sea Buckthorn oil and Jojoba Seed Oil moisturize and nourish the skin while Willowherb reduces visible redness and sensitivities. Grapeseed extract & Pomegranate Extract protect against free-radical damage. Paraben free. Can also be used to touch up dry skin at any time. We suggest that you try each of the products in the kit by itself for at least two days so that you can evaluate which is most effective for your particular skin condition. You can start with the Cleanser, then follow with Serum, Moisturizer, and the other products until you have tried them all.